As the Ford Motor Company prepares to transport people and things around in the cities of tomorrow, the automaker has recently been reminding the public of its past. According to early evidence from YouGov Plan & Track, this decision is coinciding with positive results. In late September, for example, Ford celebrated the 100th birthday of its famous Rouge factory, where, in the 1930s, over 100,000 people worked each day. More recently, Ford launched a new ad campaign called “Built Ford Proud,” which emphasizes the automaker’s history and aims to position the brand in contrast to competitors that spend too much time speculating and giving keynote addresses. On YouTube, the spot has been viewed 5.4 million times in just a few days. 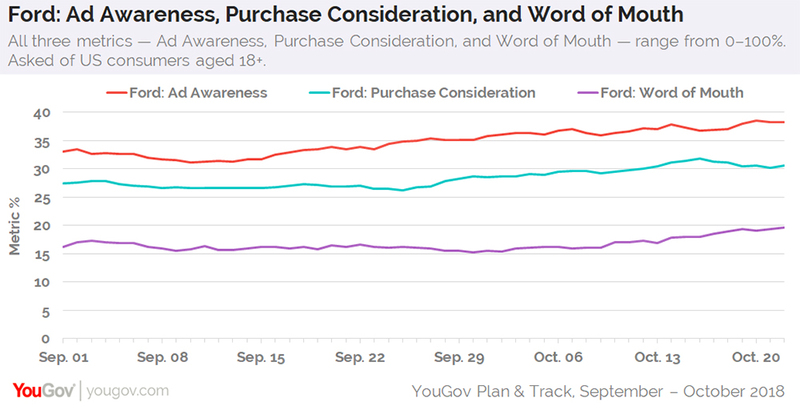 On October 1, YouGov data shows that 36% of US consumers aged 18+ recalled seeing an ad for Ford in the past two weeks. Today, that number has inched up a couple points, hitting a high of 39% over the weekend. Likewise, Ford’s Word of Mouth score, which gauges the amount of people talking about a particular brand, has also seen recent increases. On October 1, 16% of US adults said they had discussed the brand with a friend or family member in the past two weeks. At present, that number is up to one in five Americans (20%). When it comes to potential sales, the statistics are also looking rather optimistic. In total, 31% of all consumers aged 18+ currently say they’d consider purchasing a Ford when next in the market for a car or truck. That’s up from 29% at the beginning of the month. Additional figures indicate that 83% of current and former Ford customers prefer to buy American brands. The same is true for 75% of all US adults. Just over two-thirds (67%) of current and former Ford owners say they can definitely change a tire, too, compared to 60% of the general public.